Street artist and painter, Jessica Hess documents graffiti through her gallery work. 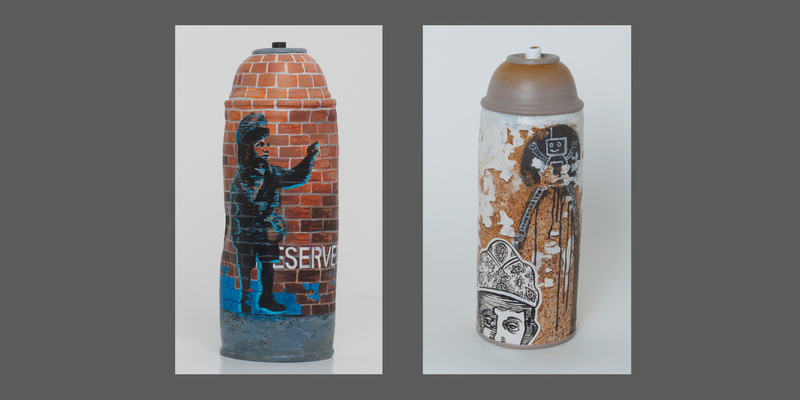 Hess collaborates with ceramics artist, Christa Assad (Ceramics Magazine’s 2013 artist of the year) to create wheel-thrown porcelain spray cans hand which are hand painted by Hess. In addition, sculptor, Jason Walker, also working with porcelain is exhibiting his surrealist sculpture titled “Gifts for the Kids: The Pine Bark Balloon”.